Is the Marketing for the Smart Car Dumb?????? I am 6′ 3″ and easily fit into the Smart Car Passion(easily fits 6′ 9″ drivers). People ask me every day if it’s safe????? Where is the Smart Car marketing??? The smart passion meets or exceeds all federal government crash test standards, including a 5-star side crash rating, and the highest scores for front and side crash worthiness and roof strength from the Insurance Institute for Highway Safety. [How come nobody knows this!] In addition, the vehicle’s safety management system is equipped with advanced crash avoidance (active safety) and crash protection (passive safety) systems that come standard on all models. Attorneys have been laidoff from Large Law Firms and have to set up a New Office – Go Used! Attorneys have been laid off from large law firms and have to set up a New Office – Go Used! Being an attorney and having attorney friends that have been laid off, I see those friends quickly rent cheap office space, rush out to Office Max and buy inexpensive furniture that does not exactly ‘WOW” a prospective client. I am suggesting you go USED! One of the large law firms I used to work for bought their furniture from Office Furniture Warehouse at 4100 Payne Avenue, Cleveland, Ohio 44103, 216.431.2700, 216.431.7778. This is not a paid advertisement or endorsement. There are used furniture stores all over, I just happen to like the team at their store, the great furniture at the store and I have purchased a lot of it. I would never consider buying new office furniture for my office or home again. 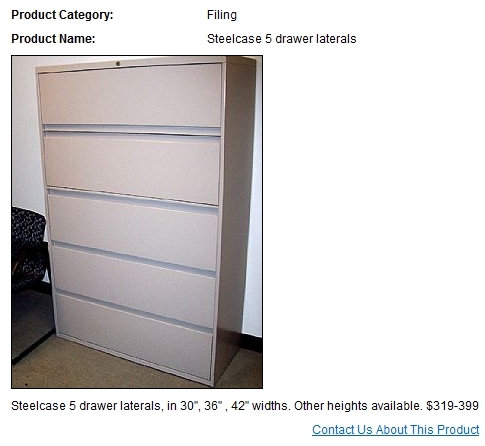 Here is one of my latest purchases, I wanted additional two 5 drawer Steelcase (Great Product) lateral files. The files look brand new and they were approximately $379 each plus $75 deliver or about $833 + a $20 tip for the deliver guys, so a total of $853 TOTAL. The files look brand new, have the keys for locking the files and they shipped them with an abundance of dividers! By the way the drivers are great and very careful in moving the furniture. Below is a picture taken off of Office Furniture Warehouse website. Just for comparison I called a local company (Canton Ohio) for a quote on new Steelcase in “case” I needed more lateral files in the future. I try to shop locally as much as possible or in Ohio. 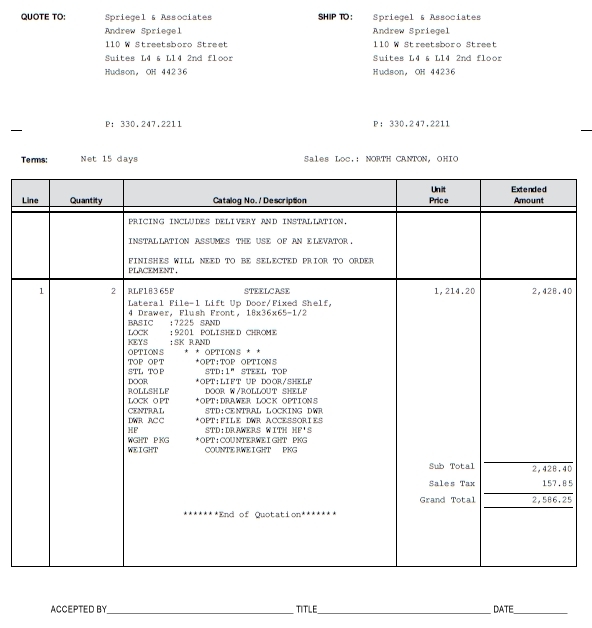 So here is the actual quote from a company located 7 miles from my home in Jackson Township, $2586.25. So I SAVED $2586.25 – $853 = $1753.25. So to all my clients and future clients, let me say I am not cheap, I am saving you money by reducing overhead and going green (the cabinets look better in my office than a landfill) so that I can pass that savings along to you. So if you read this post please ignore the tiny, almost imperceptible ding on the lower cabinet door on the right side cabinet. I interviewed Allen Ferber, the owner of Office Furniture Warehouse. Question: Where do you get your furniture? We get out furniture from mostly very large companies who are either moving and/or purchasing new furniture. More than half comes from the east coast, about a quarter comes from places like Chicago and Detroit, and that balance from metro Cleveland. Question: How do you advertise and promote you business? People find us in many ways. We advertise on Television, the internet, various print media – business magazines and newspapers. We also get a lot of our business by word of mouth. Question: How far do you ship furniture? We ship mostly in the eastern half of the United States, however 80% of our business is within a hundred miles of Cleveland. Question: What type of furniture do you sell? We sell mostly high end office furniture and some nice home office furniture, with very little lower end furniture. Question: Where are you located? Our business is located about 3 minutes from downtown Cleveland. Question: Where can I see you furniture? 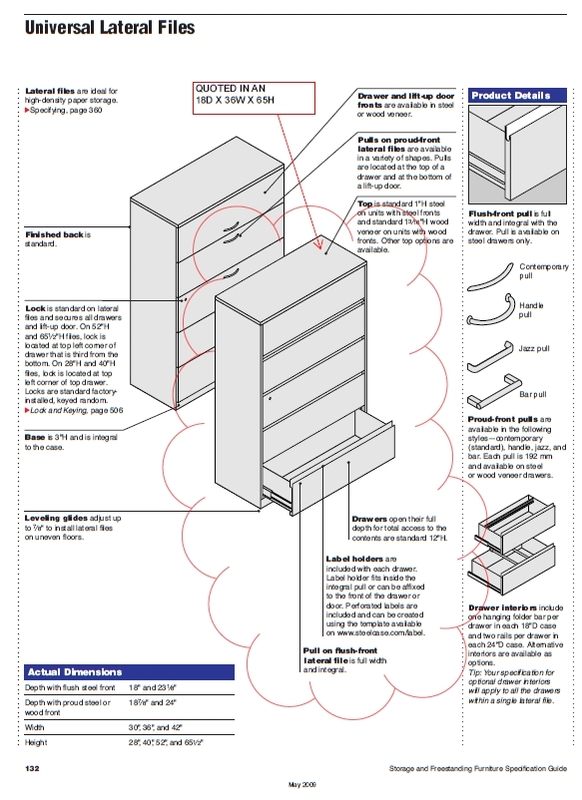 A cross section of the furniture is put on our website. – we encourage people to call with their needs and we can within a few minutes e-mail pictures of various items that may be of interest. Question: Can I get get a discount on my next purchase for writing this article? Andrew, I have a call coming in on another line, I have to go, let me call you next week. Yo Allen I am still waiting for your call! Either way you have saved me a lot of money! Take Away: So if you are looking to opening a new firm or business I recommend buying used. In addition, if you are a new client think of the money I am saving you! Not to mention the great work/services we perform. Office Furniture Warehouse at 4100 Payne Avenue, Cleveland, Ohio 44103, 216.431.2700, 216.431.7778. It is hard to believe but it is almost 2011! In June of 2009, I did a story on Lesley Dewar a retired financial planner and so much more. At that time Leslie Lesley launched “Stories My Nana Tells” as a new online publishing service for parents and grandparents of 7 year old to 12 year old children. Andrew Spriegel: Is your business progressing as well as you had expected (ups and downs)? Lesley Dewar: The business is going about as expected, but was slow to get started for reasons that will become clear. Andrew Spriegel: What have been the Ups and Downs? Downs: I had a frozen shoulder (left arm, am left handed) and could not touch a keyboard for almost five months in mid 2010 – so, I could not write my stories. I was in unbelievable pain, that totally prevented me from driving or working for weeks on end. I had my arm in a sling for three months, tried hypnotherapy; acupuncture; steroid shot; it took ten months to regain full movement of my hand, arm and shoulder. Followed by recurrent hernia that required surgery (bigger than expected) which kept me laid up for another two months. I was on crutches for a while. So, we are about twelve months behind on the business plan. 1. Ups: Built a following of 10,000+ on twitter while I was laid up – could tweet with one finger on right hand – spent hundreds of hours on line while not able to do anything else. My iPhone and Twitter saved my sanity, I am sure. 2. Ups: Found a great friend in Mike Haydon (http://twitter.com/mikehaydon ) who is also on LinkedIn. He supported me through all the pain, frustration and learning, until we could actually build the website and start putting up my stories. 3. Ups: Wrote an eBook entitled Networking To A Plan for which Peter Taliangis has written a recommendation and Mike Haydon did the webpage. The eBook has been downloaded many times through the internet. It is so popular we had to give it its own domain. 4: Ups: Have set up the website for my new business Stories My Nana Tells at Stories My Nana Tells and we have excellent feedback on the stories. 6: Ups: The delay in getting the business online gave us time to change our business model and lengthen the expected client life (family as opposed to individual child) from 2.8 yrs to 4.2 yrs). 7: Ups: Have just written a new eBook on Facebook that has been submitted to them for vetting – because we have included a wide range of screen shots of my own pages. It has already been reviewed and received some good recommendations. 10: Ups: Have shot off on a couple of trips in Australia, to an art exhibition, to Darwin and to see Lake Eyre in flood, that have given me great material for writing my stories. 12: Ups: I am alive and very well. Every day above the ground is a good day and I have a great network both on line and in the social world. Andrew Spriegel: What have been your successes and failures so far? Successes: Getting started on public speaking; launching the Stories My Nana Tells website, getting a dedicated Facebook business URL and writing two books. Getting excellent feedback on the stories I have written already; building a good online reputation; doing story reading in libraries; working with environmental groups on social issues; setting up a networking group on Ning called No Tall Poppies ( No Tall Poppies Network ) and continuing to write for a quality local Perth magazine. Failures: None that come easily to mind, except that I probably don’t get enough sleep. The website was launched to meet a deadline and we need to fine tune it – didn’t have time to do much A/B testing. I don’t really regard that as a failure – Mike Haydon and I did awesome work in ten days to have the site ready to go. Andrew Spriegel: What have been Lessons learned? Lesley Dewar: Be prepared for critics who fail to see or appreciate the time, effort and work done behind the scenes when success looks to have been achieved too easily. Don’t let online comments derail you from your purpose. The sign-up page on the website needs a more “streamlined” approach – more in line with traditional website landing pages and Mike Haydon will be doing that for us in the next week or so. Andrew Spriegel: Would you do it again? Lesley Dewar: In a flash. Andrew Spriegel: Please tell me about your grandchildren. Lesley Dewar: Mine are all grown up, so I mostly talk to other people’s grandkids. Have had a few ask me (on line) to be “their nana”. We are a great blended family though and I will see them all at Christmas and over the Holidays. I have several great Grandchildren and have attended a couple of 21st birthday parties for grandchildren – so, I am an “older” Nana. Andrew Spriegel: Do you have any other points of interest for my blog’s readership? Lesley Dewar: If you intend to use online distribution for your product or service, make it your business to understand your medium. Know how it works, how to get the best advantage out of it. Have good resources (people and systems) to help your business grow. Follow sound business practices (opt-in mailing lists, no spam, quiet demeanour online, interact, support others, network well). Strongly recommend using LinkedIn groups online and offline. Be consistent in your business behaviour and patterns. Have a sound business profile, with different interests and activities. Share your knowledge. Learn the rules and obey them. Generally speaking, be a good corporate citizen. Andrew, it is terrific to hear from you again. Try me again in six months. We will be knocking them dead! If you would like to read the original story, you can link to it here What A Party! Sometimes you just have to get out and sell it! When Dave Hoffman came to me for a consultation he needed advice on his invention. Dave had designed and built a wireless dial measurement indicator. Like most engineers (including myself) he was critical of his prototype, he wanted it to have better accuracy. I suggested that he add an attractive label to the digital display and that he have JD Sanders market the product. That’s when I found out he had ten working prototypes and I suggested he sell them all. JD Sanders has great marketing skills and in addition he worked at Cromwell Tools for two decades and had a ton of contacts in that arena. Dave had his invention written up in Machine Design and it was off to the races. Parker Hannifin, Babcock & Wilcox, JJB Engineering, Ansco CNC Specialists, Cornwell Tools and Standard Engineering Group, all of the Akron, Ohio, area, Schoeller–Bleckmann Energy Services, Grayledge Pump & Industrial LLC, Logan Machine Company and GM Lordstown, Ohio, are currently using the wireless test indicator. Self publishing a book has become easier and more profitable and a great way to brand yourself. The Spilled Coffee Chronicles is a series of volumes that document real world examples of an actual invention or business. This series (the Equal Slice Cutting Board) is made up of numerous volumes. The Equal Slice Cutting Board (www.PortionPadL.com) series is the factual story and the actual experience of an inventor Greg Getzinger and me as we worked together to move an invention from an idea to a successful, commercialized product. The Product is exceeding all sales expectations with Domino’s Pizza, Schwan’s Foods, Piccadilly Circus Pizza, Speedway and many others. an inventor and helps you to commercialize your idea or product if you move forward. What drives people to become inventors? Perhaps Edison thought it would be an illuminating experience; maybe Watt thought it would be a good way of letting off steam. However, for Andrew Spriegel, it’s about making dreams become a reality. Admittedly Mr Spriegel may not yet rank up there with the likes of Henry Ford, Wilbur Wright and George Stephenson, but his achievements should not be overlooked. He has already racked up dozens of patents to his name including products for the Invacare Corporation that dominates a $120 million a year market and has no competitor that has yet challenged the product for features and functions; and his first patent for a Laparoscopic Surgery device. Having earned a Bachelor of Science degree in Mechanical Engineering, Mr Spriegel went on to work in lead electromechanical design engineering or management positions for companies such as GE Astro Space, GE Transportation Systems, GE-Lubrizol, Lockheed Martin Missiles and Space, Invacare, GOJO Industries, Kensey Nash Corporation and IBM, while also working on designs and projects involving NASA, International and US Air Force satellites, the Space Station, Locomotives, Off-highway vehicles, surgical devices and durable medical equipment. It’s an impressive resume, but despite his personal achievements, Mr. Spriegel is not only focused on his own career – he’s also keen to help others reach the top. At 48, he entered law school to study patent law and has since set up his own firm – Spriegel and Associates – to assist inventors and companies with the complicated world of patent law.“We take on inventors only if we believe they can commercialize their product,” he said. Among the latest products Spriegel is helping to become a reality is the Portion PadL, which allows users to cut equal slices of pizza very quickly. It may seem straightforward enough but it solves a number of problems for food companies and fundraisers alike – because equal slices of pizza mean increased sales, reduced food waste and improved presentation. “It actually does what it is supposed to do and that is to allow the user to cut equal slices of pizza very quickly,” commented Spriegel. “Greg Getzinger (the inventor) did a lot of research and experimentation to perfect the product. In addition, Greg is a pizza shop owner, very driven, a lot of fun and great at marketing the product.”Another of his hot products is the Nee-Z-eeZ a sleep aid device designed to ease the pain in your back, legs, hips and knees. Inventor Frank Fleischer, who initially developed the product for himself, earns high praise from Spriegel for the shrewdness of his invention and for capitalizing on a gap in the market. Of course it’s not just individuals to which Spriegel’s inventions hold appeal – he is also keen to push products with mass market potential for businesses, such as the MyTee golf business card which helps companies get their name out into the public domain by die stamping five foldable golf tees to a business card. 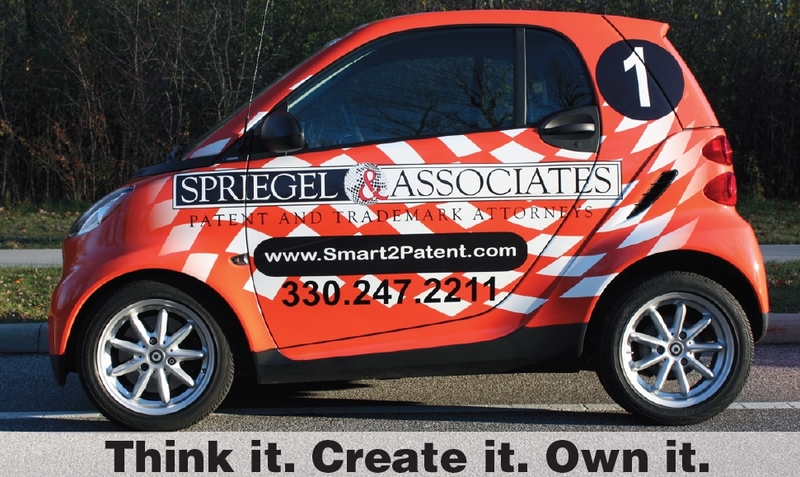 So with so many inventions under his belt, what advice would Spriegel offer to up and coming innovators? He’s also keen to drive home the importance of trademarks and patents and that inventors should seek legal advice as early as possible. He continued: “I would never commercialize a product unless I could patent it. I think an inventor should approach a patent attorney as soon as possible in the process. I also tell inventors that in commercializing a product that the patent/trademark fees in the end will only be a small part of the expenses. The ability to try lies in all of us. The invention of trying is the technology behind the next phase of breakthrough and the next generation of inventors. Do you want your business to look like a billion dollar multinational? 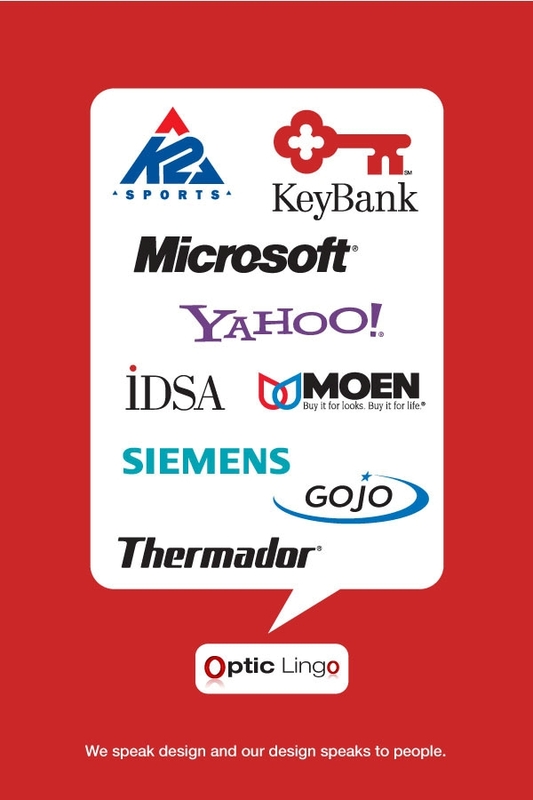 Consider Optic Lingo! How do they accomplish that work for such a range of clients? First off “they” is Craig Miloscia and he knows how to leverage his skills and others based on the job. Craig Miloscia is a very skilled industrial engineer and when he has a large job he collaborates with others. When Craig has a smaller job he tackles it himself with his immense talent. Craig knows how to work within the client’s budget. Craig Miloscia grew up in Shakers Heights, Ohio. His Father is an engineer and his mother is an artist. Industrial design was a hybrid of those 2 professions. He attended Shaker Heights High School and graduated in 1983. Graduated in 1987 from Pratt Institute in NYC with a bachelors of industrial design degree. Craig started his own full service design firm right after college graduation which is now called Optic Lingo. Early in his career worked on many team projects that won major design awards before he was 30 years old. Awards included: Time Magazine’s best consumer product of year, IDSA (Industrial Designers Society of America) gold award and ID (International Design) Magazine’s top annual review award. Since then Craig has designed state-of-the-art products that have sold around the world in the millions and they have even appeared on many television shows and in movies. B y taking communication and web design courses over the years one of his core competencies is digital design. This has helped Craig design many user experiences for prominent technology companies. Along with being design director at Optic Lingo Craig currently is an adjunct professor at University of Akron teaching web design courses and Northern Ohio chapter secretary of IDSA. Craig enjoys golfing, snowboarding and triathlons when he isn’t designing.